Congratulations to the cast and thank you to all who auditioned! Do not hesitate to reach out to us about more opportunities to get involved at Cabaret Theatre! We are pleased to announce the production staff for our final main stage production: "The Wild Party"! Thank you to all who applied! Please feel free to reach out to us about future opportunities to get involved at Cabaret! You need it. You crave it. The look, the taste, the smell. 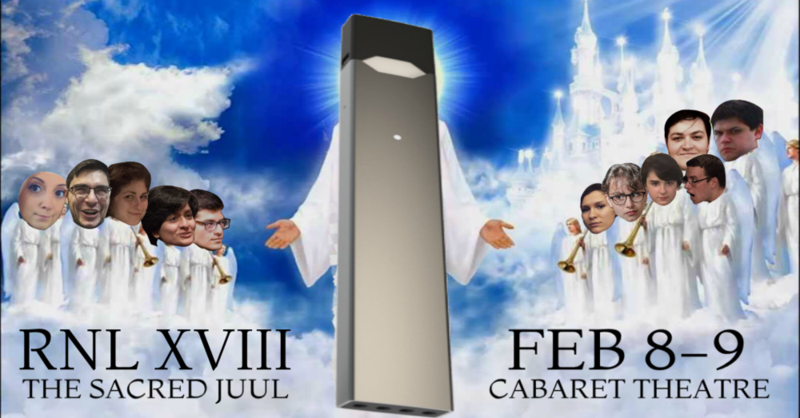 Go ahead, satisfy your addiction for Live Comedy and come see Rutgers Night Live XVIII: The Sacred Juul hosted by Colin Armstrong. We've got your fix. Come on down to Cabaret Theatre where you can rip a fat dab of pure, concentrated student-run, written, produced, and acted sketch comedy. We've got everything SNL has, a host, musical guest, digital short, weekend update, but minus the pesky budget or exposure. So come and sink your teeth into some sweet, sweet gut-busting chuckle-action with no known long-term side-effects. The applications for play submissions AND to direct for Cabaret's 11th Annual Original Play Festival are now OPEN! Should you have any questions about the application, please email the Original Play Festival Coordinator at nmt64@scarletmail.rutgers.edu AND the Artistic Director at artistic.cabarettheatre@gmail.com. Both applications will close at 11:59pm on February 4th, 2019.